While we were in New York, Colton and I ate more bread than I think I have eaten in the past year. Like, one day I literally only ate bread. Me!!! I swear, It was an entire day of carbs. I wasn’t hating on it though, because not only were we on vacation and living it up, but also because we were walking more than we ate. I’m talking 20,000+ steps a day. We did the exact same thing in Europe last summer. We had two weeks of eating pizza and drinking wine in Italy and I didn’t gain a pound thanks to walking. Did I lose muscle tone? Well that’s a different story, but we will get to that in a second. I think that walking is so incredibly underrated. Living in Houston, we literally drive everywhere and if I didn’t make a conscious effort to walk as much as I do, I do not think I would be in the shape that I am in. A few months ago, after losing my Fitbit, I noticed I was gaining weight. I was still doing my BBG program and I was eating exactly the same, so I wasn’t sure why I was gaining weight? Needless to say, I quickly realized it was due to the fact that I wasn’t walking. I would go to work, complete my BBG program in 30 minutes and then go back to work then drive home. I was probably walking less than 1 mile a day and I could definitely see it. Around Thanksgiving, Colton bought me an Apple Watch and I started tracking my steps again. After a week and a half of hitting 10,000 steps a day + my program, I was able to lose the weight I had put on. Just by making a conscious effort to walk! I wasn’t running vigorously every day or killing myself in cardio, I just started walking more. So how am I hitting my steps everyday? Taking the stairs and never the elevator. Walking Bentley around the block every morning & night. Running 3 miles twice a week. Parking in the back of the parking lot at the grocery store. Walking on an incline for 15 minutes after every BBG workout. Walking, instead of driving to places less that .25 miles from my house. All of these things help me to lose the little bit of weight I had put on. Is walking going to solve all of your problems? No, it’s not. It’s simply a great addition to be included in your healthy lifestyle. Working out, lifting weights and eating clean is still key! Walking just may help you lose those last 5 lbs you’ve been struggling with. Hello you guys! Welcome back! Pre & Post Workout Meals are vital to performing your best and seeing results. When it comes to my Pre Workout snacks, it all depends on my day and when I am working out. If I just had breakfast an hour ago, I will not have a Pre-Workout Snack, but if it has been a few hours since eating and I am working out at lunch, then I need a snack to get my energy up and to help me get through my workout. For Pre-Workout snacks, I like them to be under 200 calories, and have a mixture between carbs, a little bit of protein and healthy fats. Then when it comes to my Post Workout snacks or meals, I never miss them! It is extremely important to eat something within in hour of working out so that your body can repair itself and grow properly. For Post Workout, I aim for under 300 calories and high protein and complex carbs are key! Hard Boiled Egg: If I am working out during my lunch break, then a hard boiled egg is a really easy and quick Pre-Workout snack. I hate being full when I workout, but this snack gives me the energy I need to get through my workout. PB2 & Banana Oatmeal: I eat this oatmeal almost every single morning for breakfast and it is the perfect fuel before a morning workout. Whole oats are a complex carb that produce a steady amount of glucose in your body, which helps to keep your energy levels up and going. Blueberries & Walnuts: My most recent pre-work choice. I have been working out at lunch a lot recently and this has been a really quick and easy snack for me to bring to work with me. Blueberries are high in antioxidants and walnuts are a fat burning power food. It’s light but fuels me just enough. Banana & Almond butter: I would have to say the yummiest choice of them all! I am literally obsessed with Almond Butter, and Bananas are one of my favorite foods, so it’s a win – win. Bananas are great for a pre-workout snack because they are filled with potassium and will keep your nutrient levels high throughout your workout! They are also a good source of carbohydrates. Then almond butter is a great addition because it gives a hint or protein, fiber and healthy fats! This is a great Almond Butter brand. My Cake Batter Protein Smoothie: This smoothie, as seen here, is my favorite post workout meal. It’s delicious and is filled with protein! Plus, it literally tastes like cake batter. Protein Pancakes: My favorite post workout meal after a weekend workout. During the week I do not have enough time to make them, but for a Saturday morning they are perfect! In my Ninja Bullet, I blend 1 scoop of protein powder, 1/4 banana, 1 egg, 3 TBSP almond milk and blend. Once blended, I pour the batter onto my non stick pan and cook just like normal pancakes! On top add sliced banana and blue berries! Chicken & Broccoli: If I have a late night workout, then this is my post meal choice. Aka – dinner lol. The chicken is a lean mean that’s high in protein and then steamed vegetables are great because they are high in nutrients and fiber. Add sweet potatoes for a source of good carbs. Quest Bar: The perfect on the run post work out snack. When I do not have a lot of time, I always gram a Quest Bar. I love Quest Bars because they are not only delicious, but they are less than 200 calories, have over 20 grams of protein, only 2 grams of sugar and are gluten free. Green Protein Smoothie: The perfect post work out smoothie after a morning workout. Just like my cake batter smoothie, it’s high in protein but the spinach gives it a kick of nutrients and fiber. You can find it here! What do you guys like to eat for your Pre & Post Workout snacks? If you follow me on snapchat, then you know that I LOVE Starbucks. Yes, I know I could probably save that $2.10 everyday, but then again, it wouldn’t be the same. There is just something so much better about their coffee, than the coffee from the Kurig at my office. Not only do I love the coffee, but I also really love their food options. When I am out and about, on the go or out of town, I know that I can always rely on Starbucks for a quick an healthy meal. 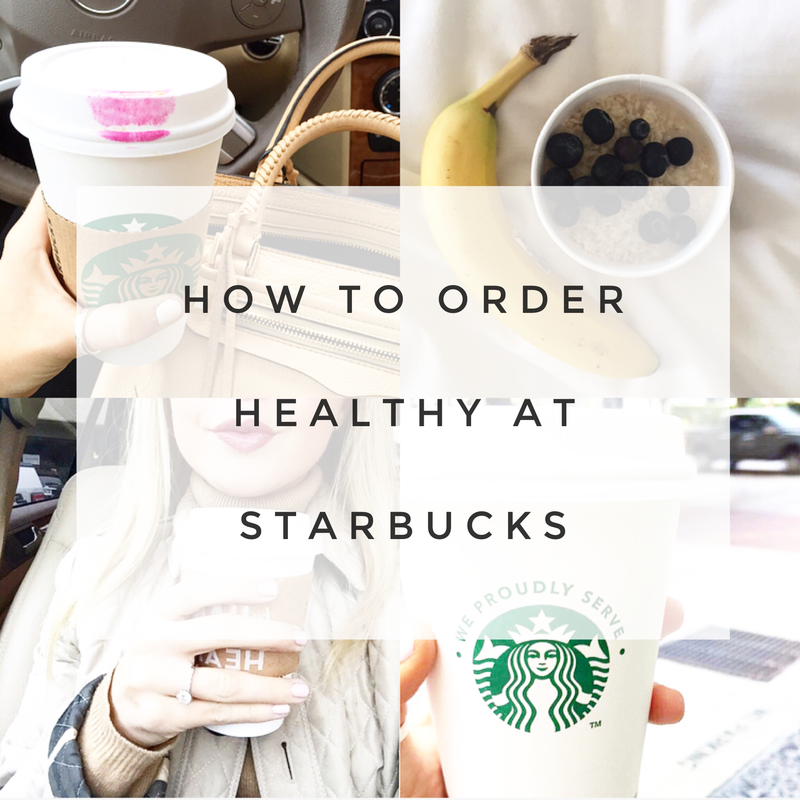 While Starbucks is notorious for unhealthy options, you don’t have to order that way. Hello, hello! Valentine’s Day is exactly one week away, and if you haven’t started thinking about what you would like to get your loved one, then today is the day! I have loved Valentines Day for as long as I can remember. Boyfriend or no boyfriend, I’ve always enjoyed the day. It’s probably because my birthday is three days after (lol) but none-the-less, growing up, my parents would always get me flowers on Valentine’s and it would make me feel super loved. Lucky me, Colton loves celebrating Valentine’s Day too! As you guys read last year, when it comes to gifts, Colton and I usually exchange Valentine’s Baskets. It’s a super fun tradition we started our first year dating and have kept going. If baskets are not your thing though, no worries, I’ve got you covered! These Kate Spade Knot Earrings are beautiful, this Rebecca Minkoff Heart Shaped Purse is absolutely adorable and this dainty heart ring would literally be the sweetest gift. If you’re in a long distance relationship, then this key chain will bring the lady in your life to tears and if you’re thinking about dropping the big bucks, then you can never go wrong with David Yurman! I also really love these pink sneakers!! They are definitely on my wish list! If your guy needs a new briefcase, then this case would be perfect! I love how trendy it is. I think this mug is literally so hilarious (here is the dating version!) and will probably be getting it for Colton (ha!). Then you can never go wrong with nice cologne as a gift, Burberry is Colton’s absolute favorite! If you’re wanting to get sentimental, then this notebook is the way to go. Inside, on each different page, write all of the things you love about him and give it to him as a gift. I promise it will put a smile on his face! If he is in dire need of a new wallet, then this one is beautiful and priced well. Then last but not least, this henley will be his new favorite item in his closet. These Bonobo Henley’s are so soft and comfortable. I have bought them for both Colton and my Dad and they both love them! What are some of you Valentine’s Day gift ideas?! I’d love to hear them!